Halibut fishing in Ketchikan, Alaska is an opportunity to take part in a core aspect of life in the local community. It gives you a chance to create memories that will last a lifetime and do something different from the norm all at the same time. For Alaskan natives, halibut has been a key source of nutrients for communities on the Pacific Coast for centuries. Fishing for halibut in warmer months was a fundamental part of obtaining a food source that could potentially last all year due to smoking and drying methods used by locals. The abundance of halibut and the sheer size of the fish has made halibut a perfect staple in people’s diet for thousands of years. In addition to king and silver salmon, the Pacific halibut is a vital part of the local economy here in Ketchikan and other Alaskan communities. Over 70,000,000 pounds of halibut are harvested annually, and halibut fishing has become very popular among sportsmen. This delicious fish is considered to be second only to king salmon among anglers in southeast Alaska. Sport fishing in Ketchikan is an aspect of life you can’t miss out on. No trip to Alaska would be complete without it. Halibut fishing can be great fun for the whole family. Halibuts are stronger fighters and one of the largest bony fish in the world. Catching a big halibut is a goal of any serious sportsmen. Halibut caught on average weigh from 15 to 20 pounds, but some anglers have caught halibut that are well over 150 pounds! In fact, the current state record for a halibut caught by a sportsman is 459 pounds! 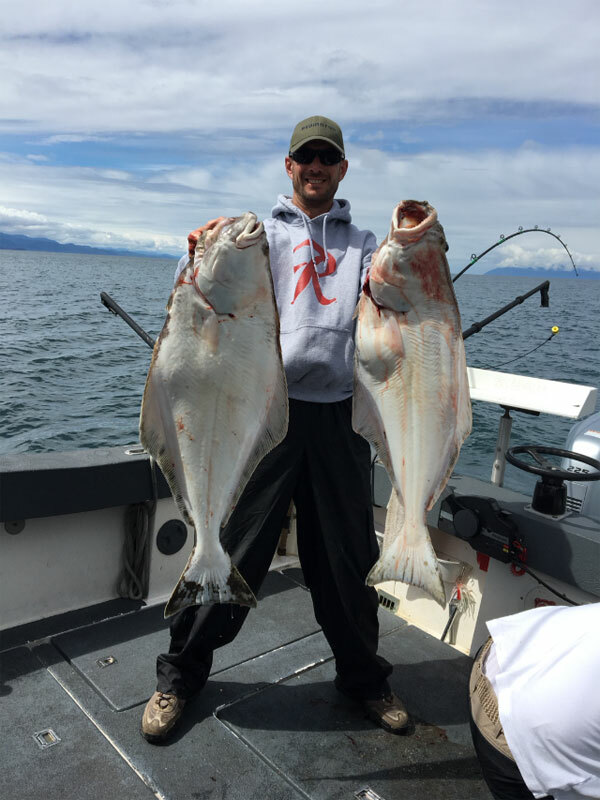 Halibut are truly a prized fish lauded by all sporting anglers alike. These flat fish are rich in Omega-3 fatty acids, protein, vitamins, and minerals. Their mild flavor makes them easy to season and cook however you like. These unique fish swim sideways in the water, and both of their eyes are found on only one side of their body. During warmer months, they are abundant in the water here in Ketchikan. Whether you are local to Alaska or are looking to visit the area for the first time, halibut fishing with family or close friends is a chance to create lasting memories and take part in a rich cultural experience. In the calm water, you can connect with yourself and those closest to you. Unwinding in nature, away from the craziness of the modern world, is something we all don’t do enough of in our daily lives. When you are fishing for halibut, you are taking part in the very act native Alaskans have been partaking in for thousands of years. There are so many beautiful sights to see and captivating wildlife to interact with in the Ketchikan area. From killer whales to sea lions to bald eagles, you never know what you’ll find in the waters offshore. At Anglers Adventures, your success is our success. We are committed to ensuring that your halibut fishing excursion will be one to remember. Our founder and captain, Brian Ringeisen is truly passionate about what he does each and every day. With over 26 years-experience guiding boats, Brian is dedicated to providing you with all the advice and insights you need to make the most of your fishing voyage. With half-day, full day, and multi-day packaging options available, you can customize your own unique halibut fishing adventure today. Decide on a date and make a reservation today to save your spot. To create memories that will last a lifetime, call Brian at (907) 254-0880, or email him at brian@anglers-adventures.com.